Fernwood Resort is located in Big Sur, California on the "Central Coast." We are about 150 miles south of San Francisco and about 300 miles north of Los Angeles. Aerial view of Fernwood Resort courtesy of Google Maps, which may help you in planning your route to Fernwood. 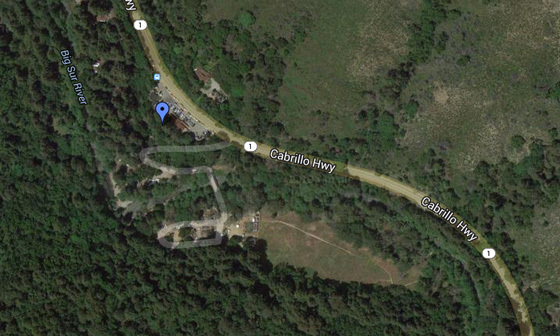 Monterey Salinas Transit offers public transportation from Carmel to Big Sur. The winter schedule only offers weekend transport but Memorial Day to Labor Day the summer schedule resumes. The bus has bicycle racks and is wheel chair accessible with several stops in the Big Sur valley. Take Route 22.